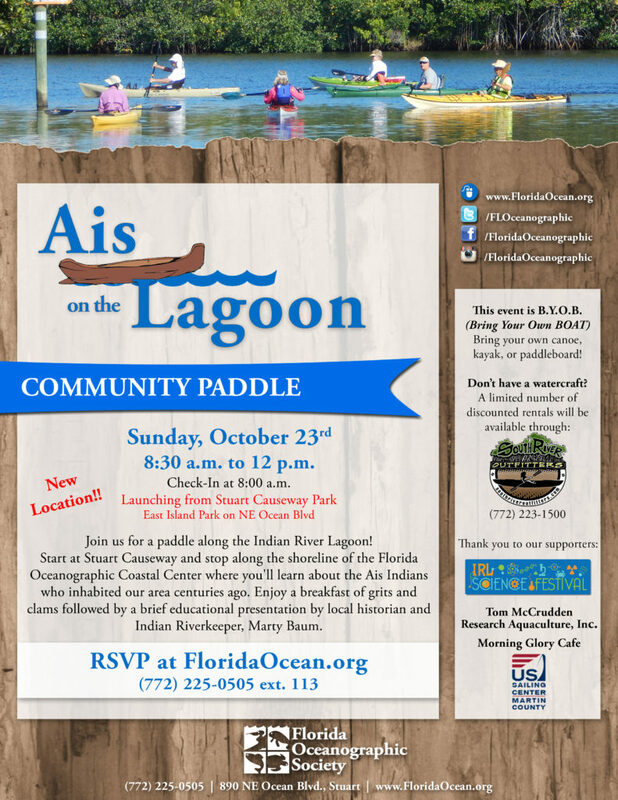 Join Florida Oceanographic Society for its annual Ais on the Lagoon Community Paddle and Breakfast on Sunday, October 23rd. This free educational event will include a 4.5 mile round-trip paddle across the Indian River Lagoon. Registration begins at 7:30 am at the US Sailing Center, and participants will launch promptly at 8:00 am. For your safety and comfort, we are relocating the launch site for this weekend’s Ais on the Lagoon Community Paddle from the US Sailing Center to the park under the east end of the Stuart Causeway. With a forecast of strong northeast winds on Sunday, this launch site will provide a more sheltered paddle up the scenic eastern shoreline of the Indian River Lagoon. Don’t worry – the paddle will still include a stop along the shoreline of Hutchinson Island for a waterfront breakfast and a historical presentation by Indian Riverkeeper Marty Baum. Our new launch time will be 8:30 am, but please arrive by 8:00 am to register and launch your kayaks. Rental kayaks are still available from South River Outfitters. Call 772-223-1500 to reserve a boat. This event is a non-motorized boating event. Participants will need to bring their own kayak, canoe, or paddle board in order to join the paddle. A limited number of rentals will be available through South River Outfitters. Please call them at (772) 223-1500 ahead of the event to reserve a kayak. As a satellite event for the IRL Science Festival for the third consecutive year, Ais on the Lagoon shares the festival’s mission to celebrate science on the Treasure Coast. Please note that RSVPs are required for this free event. For more information and to register, please visit Florida Oceanographic Society’s website at FloridaOcean.org. Florida Oceanographic Society’s mission is to inspire environmental stewardship of Florida’s coastal ecosystems through education, research and advocacy. Educational programs at the Coastal Center are designed to change the generational views of how we care for and preserve our unique environments. For more information on Florida Oceanographic, please visit the website at www.floridaocean.org or call (772) 225-0505.